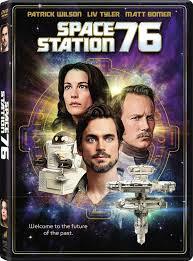 Space Station 76 is a low-key retro-styled science fiction “dramedy” that made some noise on the festival circuit earlier this year before its arrival on DVD last week.. It all takes place on an interstellar refueling satellite—not the kind you’d see in a modern, state-of-the-art sci-fi extravaganza, but rather the cosmos as envisioned by Hollywood in the mid-Seventies (hence the presence of wide-leg pants, synth-styled music and lots of groovy, retro-looking futuristic production design). We’re not talking the shiny, large-scale veneer of Star Wars, but rather the chrome and patent-leather look of Saturn 3, Silent Running, Logan’s Run, Dark Star and Space: 1999. Into this man-made atmosphere drops the station’s newest first mate, Jessica (Liv Tyler, Super), who reports to the stiff and irritable Captain Glenn (Patrick Wilson, Barry Munday). Among the several dozen denizens of the station are a lonely, married crewman (Matt Bomer), his too-cheery, hip-hugger-clad wife (Marisa Coughlan), their ethereal 7-year-old daughter (Kylie Rogers), and a bunch of beeping robots. As the increasingly lonely Jessica quickly learns, the people on board Space Station 76 have developed “issues” due to their isolation and the stress of being cooped up with one another so far from Earth. This is all in addition to the usual problems of infidelity, stress, loneliness, depression, and drug abuse that people across the galaxy have been known to struggle with! Directed and co-written by Jack Plotnick, who adapted it from his Los Angeles stage production, Space Station 76 is a dry little piece that only occasionally hits the mark. Its deliberately Seventies-styled production design, costumes and music make for an impressive send-up of the era, but the soap opera-like content is delivered so slowly that it almost feels like the film is reluctant to get its storylines going. Maybe that’s part of the overall feeling of isolation and loneliness that the filmmakers were shooting for, but it doesn’t draw one into the story. The funnier moments certainly stand out—Wilson’s sexist boozing captain with a secret and a robot psychiatrist earn some solid laughs—but one wonders why there aren’t more of them.